Craig Pedersen, operations director at Hope Gospel Mission, stands in a former assisted living facility that will be turned into rooms for mothers and their children. The charity is seeking $1.6 million from donors so it can buy and renovate the building and a neighboring one, which will house single women. 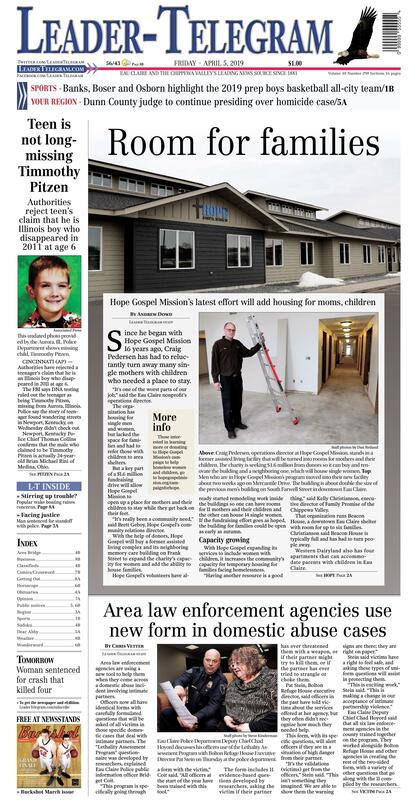 Men who are in Hope Gospel Mission's program moved into their new facility about two weeks ago on Mercantile Drive. The building is about double the size of the previous men's building on South Farwell Street in downtown Eau Claire. Since he began with Hope Gospel Mission 16 years ago, Craig Pedersen has had to reluctantly turn away many single mothers with children who needed a place to stay. “It’s one of the worst parts of our job,” said the Eau Claire nonprofit’s operations director. The organization has housing for single men and women, but lacked the space for families and had to refer those with children to area shelters. But a key part of a $1.6 million fundraising drive will allow Hope Gospel Mission to open up a place for mothers and their children to stay while they get back on their feet. “It’s really been a community need,” said Brett Geboy, Hope Gospel’s community relations director. With the help of donors, Hope Gospel will buy a former assisted living complex and its neighboring memory care building on Frank Street to expand the charity’s capacity for women and add the ability to house families. Hope Gospel’s volunteers have already started remodeling work inside the buildings so one can have rooms for 11 mothers and their children and the other can house 14 single women. If the fundraising effort goes as hoped, the building for families could be open as early as autumn. With Hope Gospel expanding its services to include women with children, it increases the community’s capacity for temporary housing for families facing homelessness. “Having another resource is a good thing,” said Kelly Christianson, executive director of Family Promise of the Chippewa Valley. That organization runs Beacon House, a downtown Eau Claire shelter with room for up to six families. Christianson said Beacon House is typically full and has had to turn people away. Western Dairyland also has four apartments that can accommodate parents with children in Eau Claire. Hope Gospel Mission has raised about $250,000 toward its $1.6 million campaign for the women’s facilities and is doing what it can to keep costs down. Eschewing the cost of a general contractor, the charity is relying on volunteers to do much of the renovation work in the buildings. And Pedersen said that repurposing the buildings, which were previously run by Care Partners before they moved to new facilities, will be significantly less costly than starting from scratch. Proceeds from Hope Gospel Mission’s newer Bargain Centers in Mondovi and Menomonie go toward running the new women’s facilities. Hope Gospel Mission is coming off the success of a $4.8 million fundraising drive that allowed it to build its new Hope Renewal Center for men at 2650 Mercantile Drive. That new building is about 24,000 square feet — double the size of its center at 8 S. Farwell St., which it moved out of last month. “We more than doubled our comfortable capacity,” Pedersen said of the new men’s building. Previously able to house 20 to 24 men in the smaller downtown building, the new facility can accommodate 48. A grand opening and ribbon-cutting for the new building is being planned. Hope Gospel Mission provides short-term housing for up to a month, but the organization is better known for a program that usually takes a year and a half. “The big distinguishing difference is it’s a long-term, get-at-the-root-cause program,” Pedersen said. The Renewed Hope program includes 1,000 hours of working at a Hope Gospel Mission building, 1,000 hours of classroom education, addiction recovery treatment, counseling, money management classes and regularly attending church services. Graduates of that program can also go into the follow-up discipleship program, where they’ll have access to a transitional apartment provided by Hope Gospel Mission until they can secure their own housing. The new men’s facility has eight discipleship transition apartments and Ruth House — currently single women’s housing at its Eau Claire Bargain Center, 2511 Moholt Drive — will be turned into apartments for female disciples. Eau Claire Police Department Deputy Chief Chad Hoyord discusses his officers use of the Lethality Assessment Program with Bolton Refuge House Executive Director Pat Stein on Thursday at the police department. Eau Claire Police Department Deputy Chief Chad Hoyord and Bolton Refuge House Executive Director Pat Stein stand near a tribute to ECPC officer Robert Bolton Thursday, April 4, 2019 at the police department. Bolton was shot and killed in 1982 while responding to a domestic violence call. Area law enforcement agencies are using a new tool to help them when they come across a domestic abuse incident involving intimate partners. Officers now all have identical forms with carefully formulated questions that will be asked of all victims in those specific domestic cases that deal with intimate partners. The “Lethality Assessment Program” questionnaire was developed by researchers, explained Eau Claire Police public information officer Bridget Coit. The form includes 11 evidence-based questions developed by researchers, asking the victim if their partner has ever threatened them with a weapon, or if their partner might try to kill them, or if the partner has ever tried to strangle or choke them. Pat Stein, Bolton Refuge House executive director, said officers in the past have told victims about the services offered at her agency, but they often didn’t recognize how much they needed help. This form, with its specific questions, will alert officers if they are in a situation of high danger from their partner. Stein said victims have a right to feel safe, and asking these types of uniform questions will assist in protecting them. Eau Claire Deputy Chief Chad Hoyord said that all six law enforcement agencies in the county trained together on the program. They worked alongside Bolton Refuge House and other agencies in creating the rest of the two-sided form, with a variety of other questions that go along with the 11 compiled by the researchers. Hoyord said they will call Bolton Refuge House or other agencies from the scene. “There are a lot of advocates and a lot of services in our community,” he said. In 2018, the Eau Claire Police Department had 1,200 domestic violence calls in city limits alone. With this new form, they’ll better be able to track the number of those calls that deal with intimate partnership domestic abuse calls. “We’d like this to be not the end, but the beginning of getting them help,” Hoyord said. The area agencies all started using the form April 1, and they’ve already had seven incidents where the questionnaire has been used. Stein said the positive news is that all seven victims contacted them for help and followed through with meeting them. “They want services, which is so important,” she said. Over the course of a year, Bolton Refuge House will see 1,300 different individuals come into their offices, Stein said. In 2018 alone, they had 253 different individuals stay in their 18-bed emergency shelter. The need is so great they are adding six apartments. CINCINNATI (AP) — Authorities have rejected a teenager’s claim that he is an Illinois boy who disappeared in 2011 at age 6. The FBI says DNA testing ruled out the teenager as being Timmothy Pitzen, missing from Aurora, Illinois. Police say the story of teenager found wandering streets in Newport, Kentucky, on Wednesday didn’t check out. Newport, Kentucky Police Chief Thomas Collins confirms that the male who claimed to be Timmothy Pitzen is actually 24-year-old Brian Michael Rini of Medina, Ohio. Chief Collins said Rini does have a prior arrest record but could not go into detail. Rini told police that he was Timmothy and that he had escaped two kidnappers in the Cincinnati area, hwo had held him captive for the past seven years. Aurora police sent two detectives to check out the teenager’s story. Police and the boy’s family say there have been other false sightings over the years. Pitzen’s grandmother says she tries not to get her hopes up after hearing that he might be alive.